Today I have been downloading pictures from my camera. I started playing with my PAINTSHOP PRO features and this is the results. 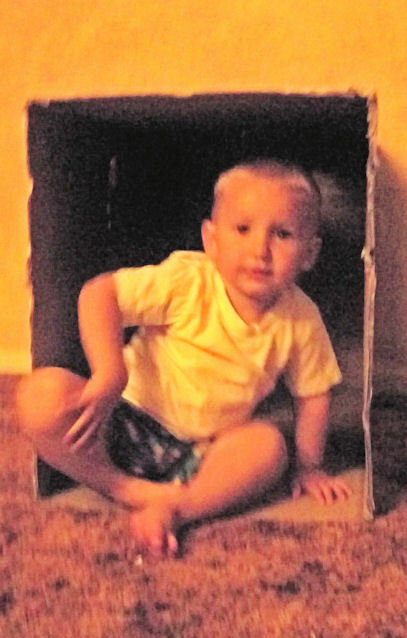 Above is the original picture .. yes slightly out of focus but trying to capture and active photo of this child is hard, as digital cameras are so much slower than film cameras. What a digital camera and computer can do that a film camera can not do is adjust the original picture and possibly save a disaster. I kind of like this painter effect… It forgave all MY MISTAKES. I am thinking this might be a good picture to use in my workshop with ANIKO FERHER on June 14th. Here is what I have been reading this past Memorial Weekend. Recommended on one of the pod cast ( sorry do not remember which one) Whimsical Projects and crafts. Short essays on why the various crafters create and craft. Art and Quilt: Design Principals adn Creativity Exercises by LYRIC KINARD. I have been picking up a number of books on techniques, creativity, design and color. This book has some great excerscise that I actually understand and can do. She suggest putting your completed excerscises in a portfolio or binder. I am finding it a great inspiration and am working my way through this book. I can also see myself repeating the excerscises as they are so much fun. Added benifit I am using the book with my great- neice ( 10 years old ) who had been spending weekends with me. Her mom says she is becoming very interested in crafting on her own. MARTHA STEWART’s ENCYCLOPEDIA OF SEWING AND FABRIC CRAFTS. I recognize some of the projects from her magazine but there are a lot of them brand new. I like the NEW ENGLAND styling of many of the projects. My daughter loves the contempory colors used. Most are simple enough a novice sewer can accomplish them. cD of patterns and templates are included at the back of the book. This was the most expensive of my recent purchases but I had a 40% and 10% total off coupon from JoAnn’s so I am enjoying it without guilt. I have collected many of her previous books on Housekeeping, Gardening, cooking and crafting. I find the information from her OMNIMEDIA group to be pretty accurate and reliable. The difference between NQS and LQS … at least my theory. 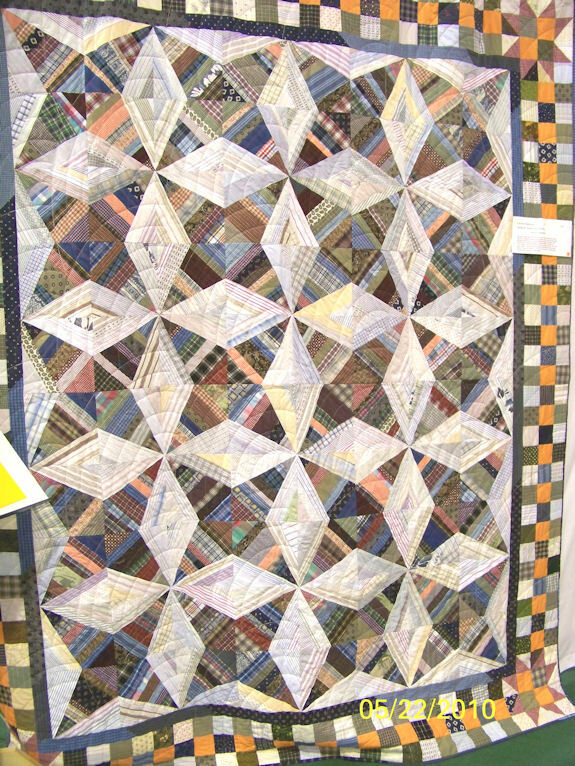 I have a theory on what makes the quilts in national quilt show different from the local quilt shows… My theory may be half baked… BUT that has never stopped me before. First let me say, I have only been to one national quilt show but I view all the online posts of trips, slide shows posted through the big venues (TQS and QNN and quilt magazines ) and the official web sites. 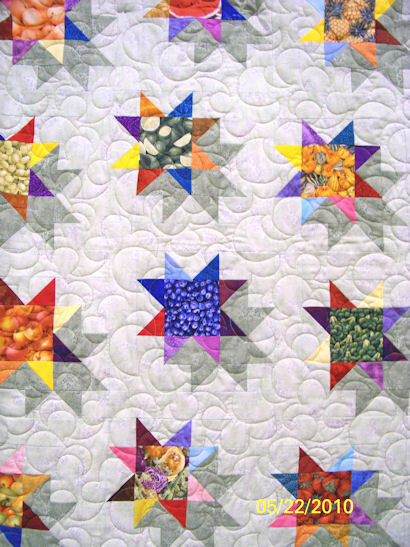 The majority of the national NQS quilts are original designs made by the quilter. Rarely are they renditions of someone else’s patterns. It is not just exquisite workman ship it is the entire creative process that is brought by the participating quilter in the national show. Fabric selection seems to be exotic and manipulated in some way by the quilter. Hand dyes, batiks, embroidery, thread painting, dying, inking, painting and highlighting of the fabrics are just a few of the techniques used. 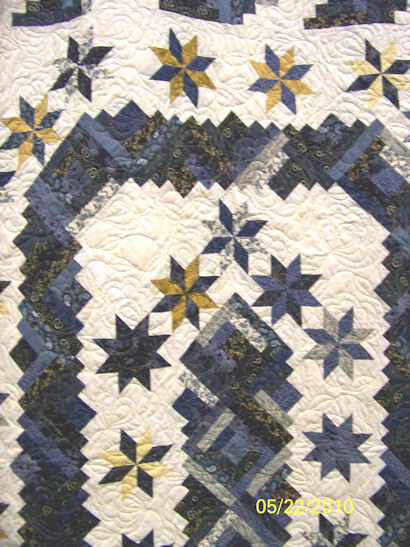 Even the traditional block pattern quilts have design elements created by the quilter that makes it original, often a border or a special feature. In contrast, the LQS quilts are replicas of a published pattern whether from a book, magazine, or purchased pattern. ( This does not make them of lesser value or less beautiful, envied or desirable.) 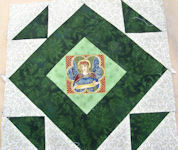 Frequently at a LQS you will see multiples of the same quilt made from a workshop or class by different people. This can be interesting because you can see different color-ways and interpretations of the pattern by the different quilters. 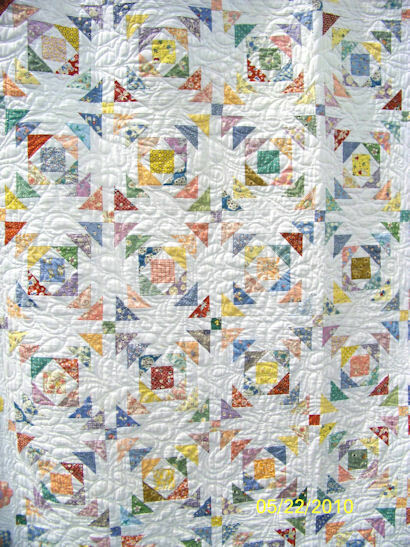 The NQS quilts tend to be what I call “quilted to death.” They are meant to be displayed at the show not used in a home. The extensive quilting removes the warmth and drape-ability of NQS quilts. 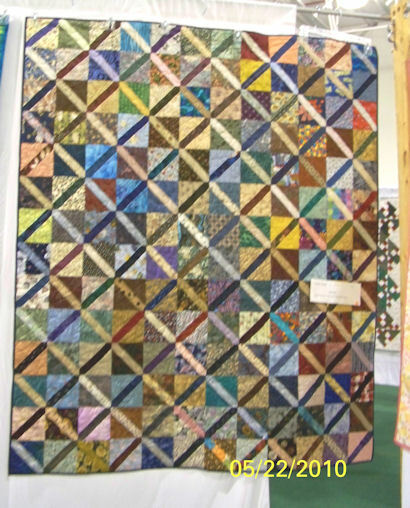 LQS quilts will usually be used in the home either by the owner or as a gift for some lucky recipient after the show. The quilting still beautiful is much less extensive with less of the micro quilting techniques. I sometime think size is a criteria LQS quilts tend to be larger bed size quilts, while NQS quilts tend to be smaller, squarer ( I can only go by posted measurements ) wall hanging variety. I find these quilts on display in homes, museums, collections or as wall displays rather than on a bed. Well this is my theory and I stand by it. Please leave a comment and tell me why I am all wrong. Sorry no pictures included to demonstrate my points. NONNIE, Nonnie how does your garden grow? My garden was devistated last fall when we had to dig up a new well head. 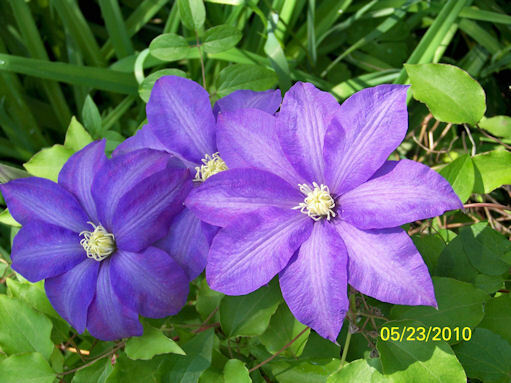 My climantes is working over time to make up for the distruction of the rest of the garden…. 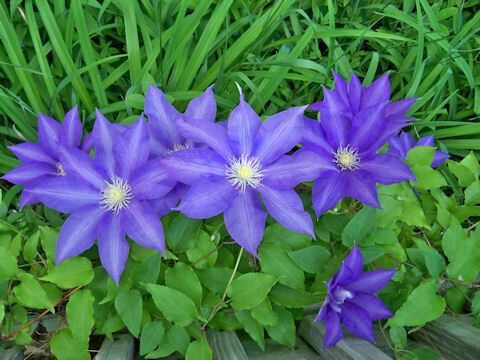 The bright side… I am starting over fixing my gardening mistakes. More pictures will show up on this post in the coming days. 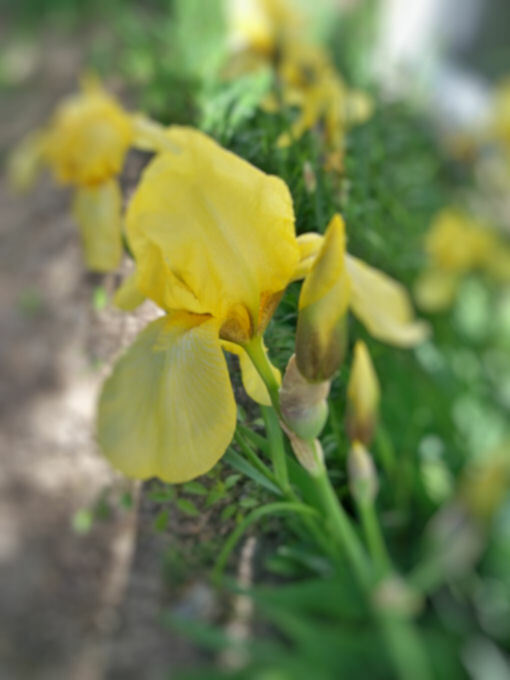 Iris in my garden, Why do they not last all summer? You can see a shadow behind the star. I saw a lot of quilt using similar techniques of placing shadow shapes behind the main motif. Many of the quilts had interesting light vs dark details in the quilts. I have always seen this pattern using half square triangles. This block seems to have one third dark on the diagonal. Light and dark is altered to get a zigzag setting. It was machine quilted, machine pieced. I met the lady who made this quilt. I love the contrast of her darks and lights. This was a free pattern from Bonnie Hunt’s Quiltville. The quilter said most of the fun of making this quilt was haunting thrift stores and Goodwill collecting the shirts and fabric to make the quilt. CAN YOU FIND YOUR HUSBAND’S SHIRT? I love the flying geese in this pattern. Flying Geese is one of my favorite patterns ever since I learned to make them using Eleanor Burns’ easy technique. 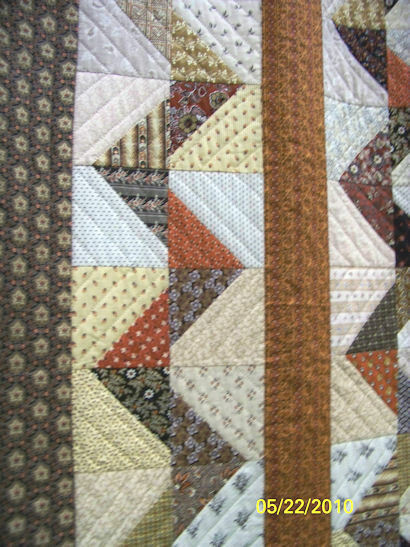 This simple split on the diagonal block with contrasting strip sewn through the center turns into…..
A GREAT QUILT… I love the interplay of all the dark stripes going one way and the light stripes going the other way. Once again I enjoy the interplay between light and dark in this furrows setting. I also like the borders, again with the light and dark contrasting piecing. I think this guild may have had some workshops on working with shadows and light and dark contrasts. This is a very design oriented guild with several members who have published their own patterns. 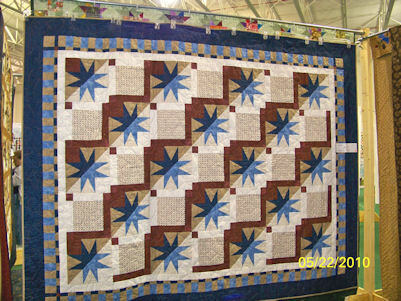 I loved the combination of the log cabin blocks and the stars center medallion. The machine quilting on this quilt was lovely. It could go to my home any time it wanted. I will post more pictures as soon as they are edited. Please let me know what do you think of my size selection. I want the jpegs big enough to see, but not so big they eat up my allotment. I am researching all of these books because they deal with different style of settings. I especially appreciate the books that deal with different ways of dealing with different size blocks. I find the traditional style of sampler blocks where the blocks just line up with sashing kind of boring. I will be posting some of the information I have gleaned from my readings in a future post. If I use them I will tell you if they work or not. I belonged to three BOM clubs about a year ago and I made most of the blocks out of what I called my Christmas fabrics… all rich golds, green, red, burgundy, royal blues… saturated jewel tones. Well I have the blocks … now what do I do with them? All blocks are different sizes ranging from 9 inch finished to 18 ( or maybe 20 inch) I am going to post pictures ( over the next couple of days) on this blog and maybe someone can give me an idea on the setting. Just not sure. Finished anticipated size…. generous QUEEN – KING. I have about 20 blocks made but not all need to go into the quilt. PICTURES HAVE MINOR EDITING … TO MAKE THEM EASIER TO VIEW:These blocks are unpessed, unsquared, unblocked. I do that all just before I set them into the quilt top. More blocks will be posted here over the next couple of days, I am finishing blocks just half done. Advice is always appreciated but not always followed. If I could figure out how to align these blocks this page would be prettier.